The Musical Priest: Wine Team, Assemble! Just over six months ago, several severely under-worked divinity school students gathered together in order to "discern spirits" by which, we of course meant, sampling a variety of wines one could purchase at the Costco. 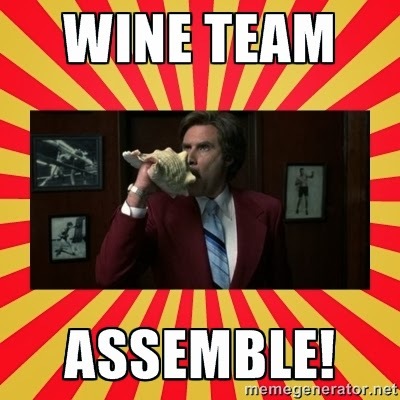 On this mild winter night in Brighton, I have once again put the conch shell to my lips and let the call go out across the land: Wine Team, Assemble! The call has gone out and it has been heard. From across the Boston area, men and women of good will are gathering together to drink inexpensive wine, to pretend to have an idea of what we're talking about, and to spend some time with one another. 1 Chalice: Jesus went to the Cross so that you could make this? Was this the "wine mixed with gall" he refused (Matthew 27:37, Mark 15:23). Definitely a mortal sin. 2 Chalices: This is probably a venial sin of the vine but, if you want to make an integral and perfect wine confession, you should mention it. 3 Chalices: Enjoyable without guilt. Conventional. 4 Chalices: A wine worthy of a saint. Goes above and beyond what is expected. Heroic effort and true virtue. Depending on who is still standing after each tasting, we will gather our evaluations into a "spiritual bouquet" and share with readers our thoughts. Again, this is all meant in a spirit of fun and frivolity. We may be able to tell you the importance of "consubstantial" but we're hardly wine experts. We're just graduate students looking for any excuse to hang out and have fun.